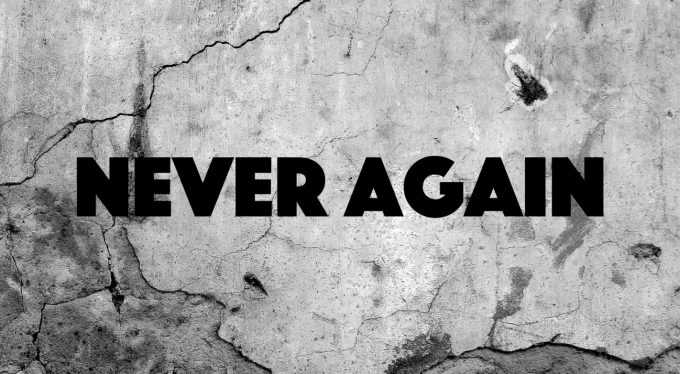 GENOCIDE, HOLOCAUST - NEVER AGAIN! 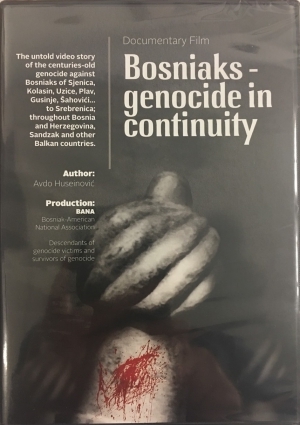 After watching the documentary film, “Bosniaks - Genocide in Continuity” (author Avdo Huseinovic), Production Bosniak American National Association (BANA), I felt very eager to write a short detailed report based on what happened in Bosnia and Herzegovina and in Sandzak, in which an aggression was performed by Serb-Montenegrins, which ultimately led to a Genocide on my people recently and hundreds of years ago. When I was in my English class, last semester in college in the spring of 2017, my professor told us she would like for us to write a 2,000 word report based on anything we wanted, so I decided to write my report on what happened in Bosnia and Herzegovina and Sandzak. When I had told my professor what I wanted to write about, she was all for it. She even called out the class to hear what my research paper was going to be about and many sat in silence after what I had explained had happened in Bosnia and Sandzak. For most of the students this was their first time hearing of these countries, yet they felt shocked after I had explained this to them. Some students even approached me to give them a better understanding of what happened, which I gave them to the best of my ability and I tried to explain as much as I can of what happened and why they attacked us. After I finished my report, I was very delighted that I used all knowledge that I had and information that I gathered from many resources to write my report which I yearned to write about. My family and my professor were overjoyed for writing my report on this topic because many people don’t know what happened in Bosnia 22 years ago or what happened in Sandzak nearly 100 years ago. I wrote this report so that my generation and generations to come know who they are, where they come from, what flag they should hold and to never forget what happened to our people many years ago! BY AMMAR KRCIC: Nations across the world have to come together and form a new law that would be stronger, so that those who try to commit genocide can’t because of how impactful the law will be. Either it be that if any such crimes are carried out, then there should be consequences that follow immediately when news breaks out; removing those that carry out mass murder from power (i.e., a nation’s ruler, military officers, etc.). As mentioned throughout the paper, the genocide that has befallen on the Bosniak people has been ongoing since the first attack and the ethnic cleansing on the Bosniaks over a hundred of years ago. Although genocide should be prevented, the fear for such a massacre to happen again is likely since the Bosniak people have been attacked and have been victims of genocide for many years. Especially after the former prime minister of Serbia, Aleksandar Vučić, became the president of Serbia, who around 20 years ago to the counsel of the North Atlantic Treaty Organization (NATO), Aleksandar Vučić stated, “For every one Serbian killed, 100 muslims will be killed because of that and we will see if anyone can attack Serbia...” The future generations around the whole world have to stand against all of this hate, so that genocide and the Holocaust never happens again. Mankind, as we know, is continuing but it is already over for us with all this war and the many differences everyone has for one another; corruption amongst different corporations has made war as an opportunity for businessmen to make money while others suffer. War isn’t a fight one wants to win, war today is about getting rid of differences in the hardest way possible-Genocide- but to them it seems like the cruelest option is the only option. While thinking about the topic, I searched images of kids throughout history during the war, genocide, and Holocaust to find out more on how they were treated in concentration camps and how they were abused and killed-- the results I’ve found were completely and utterly atrocious. Twenty-five years ago, the Serbian and Montenegro aggression on Bosnia started. This aggression quickly escalated to something much worse in which my family from my mother’s side were greatly affected by it. 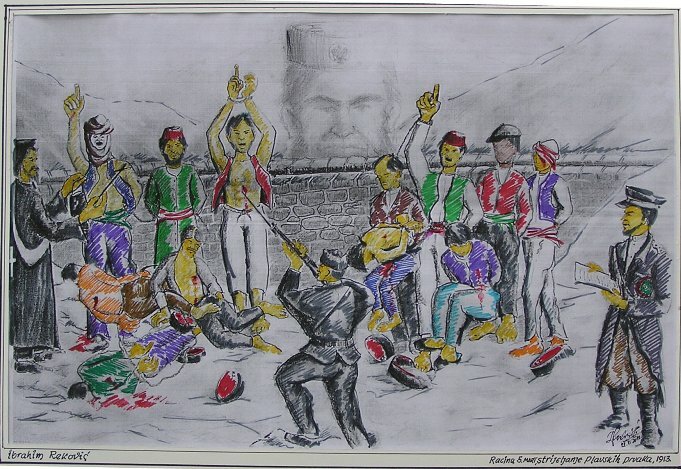 Serbian forces ordered that people who were Bosniak/Muslim and Croat/Catholic must wear white arm bands to signify who they were and differentiate themselves from Serbian civilians. My mother, at the time, lived in a city called Prijedor which is located in the Northwest in Bosnia. Prijedor during the time of war was a city full of concentration camps (Omarska, Trnopolje, Keraterm, etc.) made for Bosniak/Muslim and Croat/Catholic. This similar situation happened to the Jews during the Holocaust in World War II. My mother is a genocide survivor and, sadly, I can’t say the same for my uncle. My uncle who was only 20 at the time, an innocent man, did nothing wrong, but he was killed only because he was Bosnian and because he was Muslim. This happened throughout Bosnia from 1992-1995. People were killed because of who they were, because they were different. Genocides, like the one in Bosnia, happened all over the world to different people because of who they were. It happened in the 1990’s in Rwanda, Cambodia, and Sudan. Before that, during the second World War, the Jewish Holocaust happened. You see it nowadays in Syria, Iraq, Myanmar, Burma and many more. This unfortunately won’t end; this is the beginning of more horrific events to come. It will continue like rust, little by little it will get worse until everything is destroyed. Before going any further, I would like to state that due to this topic being very dense, I will be focusing formally on what happened to the Bosniak people in the past century. 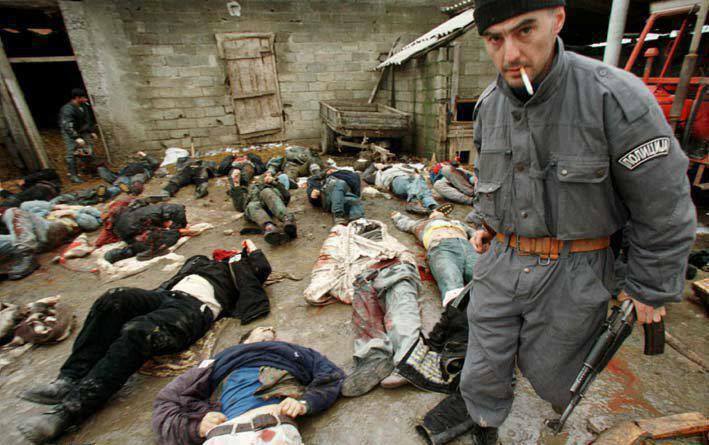 Serb-Montenegrien soldiers killing Bosniaks Muslims; priest converting Bosniaks Muslims. King Nikola in the background, the man that is responsible for the Plav and Gusinje Genocide. 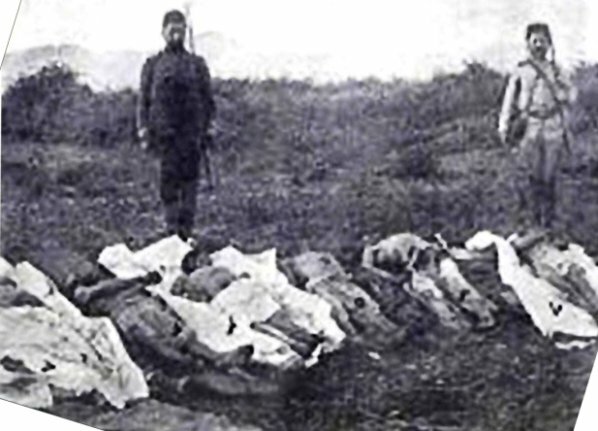 After a few years, it happened again, another Genocide was committed in a village in Šahovići, region of Sandžak, Montenegro in 1924. The motive for this attack of the people of Šahovići was that the people of Kolašin thought someone from Šahovići murdered their town chief, Boško Bošković. But, Boško Bošković was killed by the Montenegrin Committee Radoš and Drago Bulatović from Rovac As a result of their wrong thoughts, the officials at that time allowed the people of Kolašin 48 hours to get their revenge. This was not a war. At that time, everyone was in peace, but this was a pure genocidal attack and in only two days days, between the 9th and 10th of November, that village was cleansed and the village's name was changed to Tomaševo. After the ethnic cleansing of the Bosniak Muslims, no one from the old town of Šahovići lives in what is known today as Tomaševo. Milovan Đilas, a Serbian descendent and author of the book Land Without Justice and son of a father who participated in the Šahovići massacre wrote about his father’s experiences and what he witnessed at the time of the eradication. “Babes were taken from the arms of mothers and sisters and slaughtered before their eyes.” ("Šahovići massacre." Institute for research of Genocide, 11 May 2017. Web. 16 May 2017. ) It was only after the attack that Milovan’s father called this act, that he and others committed, a genocide against people who believed in God. Furthermore, he acquired knowledge that the Bosniak Muslims in Šahovići did not kill Boško Bošković, rather it was one of their own people, a Montenegrin that had killed him. Soldiers from Kolašin posing in photo over Bosniaks they’ve killed. 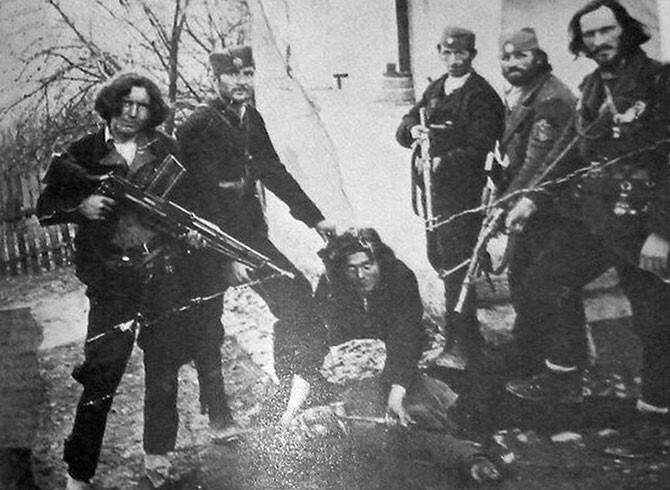 Photograph of Serbian Chetniks posing before they kill the victim with a dagger. Genocide: Bosniak civilians in the Serbian Concentration Camp. The most recent attack by Serb-Montenegrin forces was in 1992-1995 and those that were killed in this war and genocide goes over 100,000 and still counting because of an implementation of mass graves. Even worse, because the Serbs thought if the graves were ever found, people would be able to recognize and use their DNA to track them to know who they were and give those who were deceased a burial. The war criminals separated body parts and scattered them across the country so that it would be hard for those to find and place the body whole again and hide the crimes that they committed in order for them not to be tried in court. On July 11th, 1995, the U.N who at the time were in Srebrenica, a town that was a safe zone, were protecting the town from Serbian invasion. 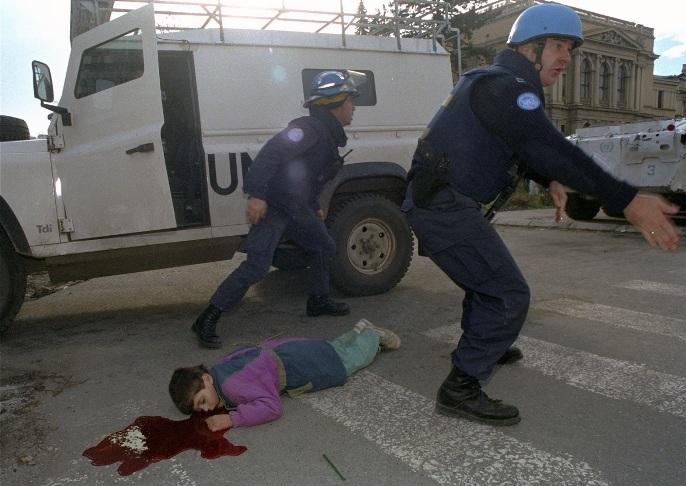 After the U.N peacekeepers left their post, the Serbs saw that as their advantage to move in and start their massacre. More than 10,000 Bosniak Muslims, mostly men and boys were killed in and around Srebrenica ("Srebrenica massacre." Institute for research of Genocide, Sarajevo BiH, 16 May 2017. Web. 16 May 2017. ) Today, Srebrenica is a town full of headstones known for what had happened. After Radovan Karadžić was tried and sent to prison for 40 years by the International Court of Justice in Hague for the genocide committed on the Bosniak Muslims in Srebrenica, Srebrenica was then officially known as an act of genocide. 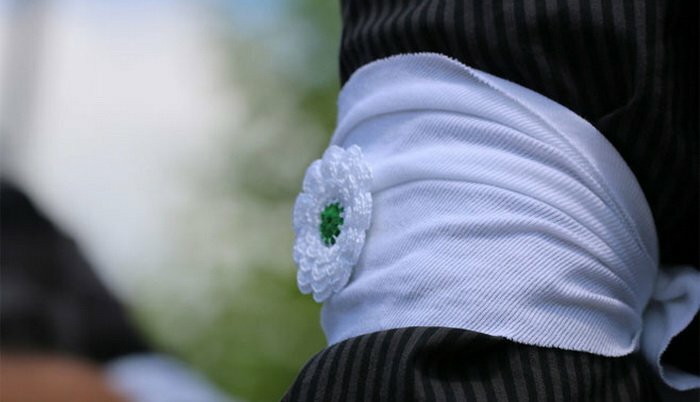 Every year, people who are against eradication including different government officials from different countries from all over the world would go to Srebrenica to pay their respects on July 11th because that is when the genocide in Srebrenica occurred. GENOCIDE IN SREBRENICA: Mass Grave found in Bosnia and Herzegovina. Genocide didn’t only happen in Srebrenica, but it had also happened in Prijedor, Višegrad, Zvornik, Foča, Bratunac, Kljuć, Sanski Most, etc. Sarajevo, the capital of Bosnia, was under the longest siege in history for a total of 1,460 days. In that period, 11,600 civilians were killed. From that number, 1,600 kids were killed because of sniper fire, grenades and other crimes. At the moment, Ratko Mladic is in process in the International Court of Justice in Hague for the crimes he committed in the Bosnian War. This is what genocide is. The most sickest and horrifying thing that can ever happen to any person and it’s all because they are “different” and are seen as a “threat” to those who are oppressing them. This will continue to happen if no one has the voice and courage to stand up against it. It is our duty to do everything we can in order to stop another atrocity and genocide of happening because those who did it once and were not punished for it despite overwhelming evidence, are deemed to repeat it again. Serbians are denying genocide for which they are legally convicted; they have been given over a thousand of years of prison time, collectively for the crimes they did, including genocide in Srebrenica. Yet, they are constantly and consistently denying it, and that is a step in the direction of repeating it. They must be stopped before it is too late. Nations across the world have to come together and form a new law that would be stronger, so that those who try to commit genocide can’t because of how impactful the law will be. Either it be that if any such crimes are carried out, then there should be consequences that follow immediately when news breaks out; removing those that carry out mass murder from power (i.e., a nation’s ruler, military officers, etc.). As mentioned throughout the paper, the genocide that has befallen on the Bosniak people has been ongoing since the first attack and the ethnic cleansing on the Bosniaks over a hundred of years ago. Although genocide should be prevented, the fear for such a massacre to happen again is likely since the Bosniak people have been attacked and have been victims of genocide for many years. Especially after the former prime minister of Serbia, Aleksandar Vučić, became the president of Serbia, who around 20 years ago to the counsel of the North Atlantic Treaty Organization (NATO), Aleksandar Vučić stated, “For every one Serbian killed, 100 muslims will be killed because of that and we will see if anyone can attack Serbia...” (Dokumentarcibalkan. "IZGUBLJENI SNIMAK: Aleksandar Vučić - Ubijte jednog Srbina, mi ćemo stotinu muslimana! (20.07.1995)." YouTube. YouTube, 04 Nov. 2015. Web. 10 May 2017.) The future generations around the whole world have to stand against all of this hate, so that genocide and the Holocaust never happens again. 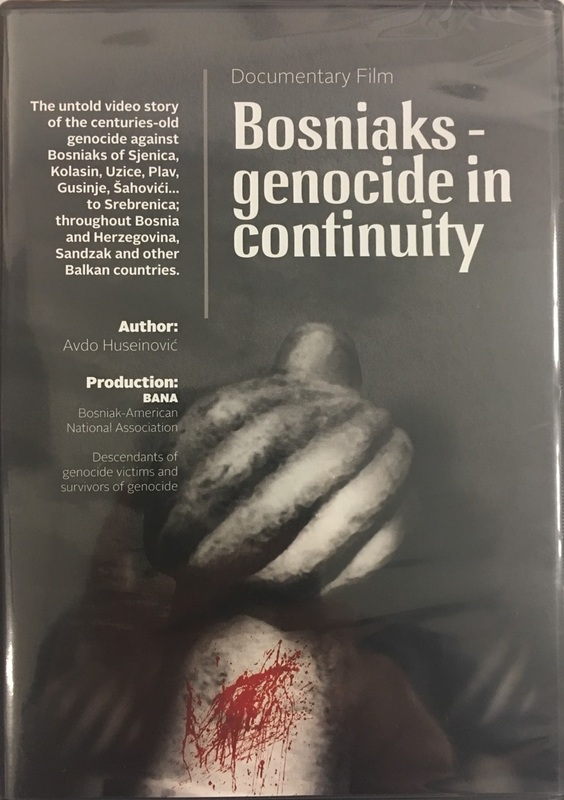 Bosniaks Genocide in Continuity. Dir. Avdo Huseinovic. "Bosnian genocide." Institute for research of Genocide, Sarajevo BiH, 08 May 2017. Web. 10 May 2017. History.com Staff. "Bosnian Genocide." History.com. A&E Television Networks, 2009. Web. 10 May 2017. Internationl Tribunal in Den Hague, Nederlands. Evidence of genocide in Srebrenica, 05 May. 2015. Web. 11 May 2015. Dokumentarcibalkan. "IZGUBLJENI SNIMAK: Aleksandar Vučić - Ubijte jednog Srbina, mi ćemo stotinu muslimana! (20.07.1995)." YouTube. YouTube, 04 Nov. 2015. Web. 10 May 2017. "ACTION ALERT: Genocide in Plav/Gusinje." Institute For Research of Genocide Canada IGC. N.p., n.d. Web. 10 May 2017. "Bosnjaci.Net." Bosnjaci.Net - Najcitaniji Web Magazin Bosnjaka u Bosni i Hercegovini i Dijaspori. N.p., n.d. Web. 10 May 2017. Krcic, Esad. "A CENTURY OF MONTENEGRIN GENOCIDE ON BOSNIAKS AND ALBANIANS IN PLAV AND GUSINJE." Bosniaks.Net. N.p., n.d. Web. 16 May 2017. "Šahovići massacre." Institute for research of Genocide, Sarajevo BiH, 11 May 2017. Web. 16 May 2017. 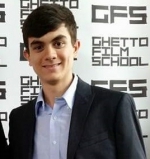 "Chetnik Collaboration & Genocide." The Espresso Stalinist. N.p., 24 Mar. 2014. Web. 16 May 2017. "Srebrenica Genocide." Institute for research of Genocide, Sarajevo BiH, 16 May 2017. Web. 16 May 2017.